28/01/2011 - The pace heated up tonight at the ILT Velodrome for the second night of Cycling Southland’s 2011 Track Championships. Sprint titles were handed out across six divisions. In the Under 17 Girls Laura Heywood continued her fine form from Tuesday night to register victory over Jen Muhl. Michael Culling again showed his class to take out the Under 17 Boys title from Josh Haggerty while New Zealand representative Steph McKenzie was untouchable in the Under 19 Women’s category, controlling the final against Sophie Williamson. The Elite Women’s gold went to Kathryn Phillips over Emma Gibb. The Under 19 Men’s final saw New Zealand representative Tom Beadle grab victory from Jamie Culling and the Elite Men’s gold went to Cycling Southland’s Development Officer Matt Archibald who registered a blistering 10.651 sec over 200 metres in qualifying and defeated Lee Evans two-straight in the final. In the Men’s Masters 2 and 3 Points Race, Dunedin’s Neil Derbyshire lapped the field to take victory in Masters 2 with Neil Familton taking the Southland title as first local home, while Ray Robinson made it three titles in a row in Masters 3, pipping Bruce Jones for the win. The Masters 1 Points Race featured a three battle between Michael White, Derek Tan and another Dunedin visitor Chris Henderson which went all the way to the final sprint of the 15 kilometre journey. Tan exploded into life two laps from home and stole the final sprint but it wasn’t enough to deny White who snuck victory by a solitary point from a gallant Tan. The evening concluded with Scratch races for Elite and Under 19 Men and Women. Sophie Williamson stole away over the closing stages of the Women's race to be first across the line and grab the Under 19 title from Sarah Tomlinson and Kelsey Timpany. First Elite Woman home was Otago's Kathryn Jones with the Southland title being awarded to Kylie Young who beat home Sequoia Cooper and Kylea Gough. The men finished proceedings with a spectacular race over 40 hotly contested laps. Following early attacks from Lee Evans and Andy van der Heyden it was ultimately Pieter Bulling who added yet another gold to his bulging collection who claimed the win with Tom Beadle and Tom Vessey grabbing the minor Under 19 medals. The Elite title went to second placed finisher Brehan Cairns. 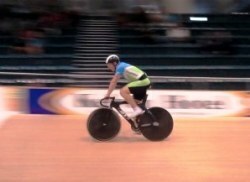 The Southland Track Champs end with Individual Pursuits, Keirins, Points and Junior Derby races across morning and afternoon sessions tomorrow (Saturday) starting at 10am and 4pm.